NEBNext® Multiplex Oligos provide adaptors and primers to enable high yield multiplex Illumina® library production. The unique hairpin loop structure of the NEBNext Adaptor minimizes adaptor-dimer formation, and NEBNext index PCR primers enable index incorporation during library amplification. Additional NEBNext Multiplex Oligos products are available with sets of 12- and 96- single index primers as well as dual index primers. Incorporating a novel hairpin loop structure, the NEBNext Adaptor ligates with increased efficiency to end-repaired, dA-tailed DNA. The loop contains a U, which is removed by treatment with USER™ Enzyme (a mix of UDG and Endo VIII), to open up the loop and make it available as a substrate for PCR. During PCR, barcodes can be incorporated by use of the NEBNext index primers, thereby enabling multiplexing. NEBNext Oligos can be used with NEBNext products, and with other standard Illumina-compatible library preparation protocols. Additional single- or dual-barcode primer options are available, in 12- and 96- index formats (NEB #E7335, NEB #E7710, NEB #E7730, NEB #E6609, NEB #E7600). A methylated version of the NEBNext Adaptor is also available for use with bisulfite sequencing protocols (NEB #E7535). For larger volume requirements, customized and bulk packaging is available by purchasing through the OEM/Bulks department at NEB. Please contact [email protected] for further information. 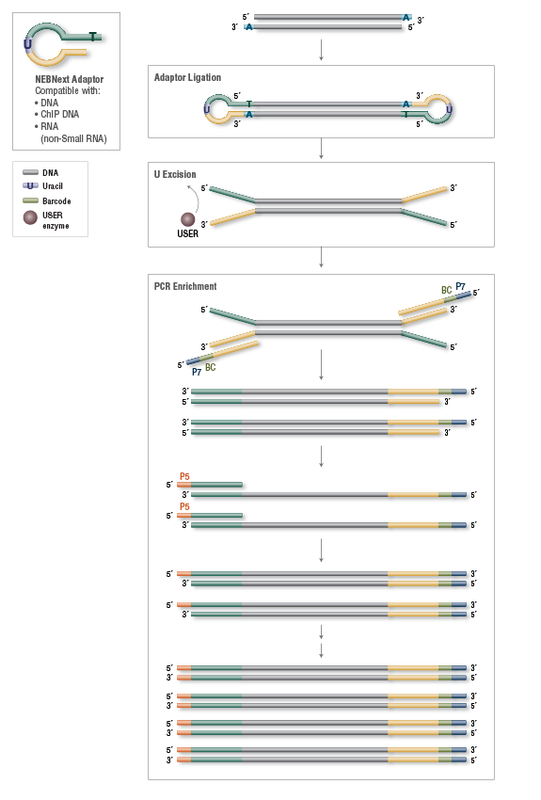 Each set of reagents is functionally validated together through construction and sequencing of genomic DNA libraries on the Illumina sequencing platform. For the list of additional materials required, please check the manual for your NEBNext Library Prep Kit. Refer to the manual for a list of NEBNext library prep kits that contain protocols for use of NEBNext adaptors and primers. Are NEBNext adaptors and primers for Illumina validated in Next Generation Sequencing Workflows? Are NEBNext adaptor and primers for Illumina compatible with NEBNext reagents for Illumina library preparation? Is USER enzyme required for library preparation using NEBNext adaptor and primers for Illumina? How much DNA can I ligate to the NEBNext adaptor for Illumina in one ligation reaction? Are these reagents available in a customized format, larger format or 96 well format? Can USER Enzyme be purchased separately? 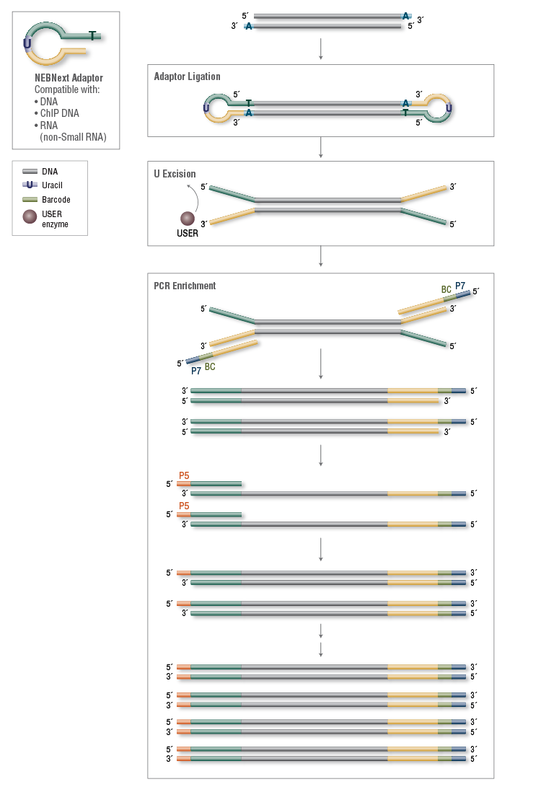 Are the NEBNext Oligos for Illumina compatible with single read and paired end sequencing? Is the USER enzyme in our NEBNext kits identical in concentration to the standalone product? What should I do if the sample sheet from the NEB.com website is not compatible with the software version I am using? Contents ©New England Biolabs Ltd. New England Biolabs Ltd. is the exclusive Canadian distributor for Cell Signaling Technology, Inc. New England Biolabs, Inc. is an ISO 9001 certified company. Do you really want to sign out ?